One of the oldest online dating sites, Matchmaker started in 1996. Unlike some sites that cater to literally everyone, Matchmaker has a clear and serious mission – to help singles over the age of 35 find lasting love. It’s free to join and you’ll have access to some features immediately, including search and limited messaging. Creating a profile is easy, too. Just fill out basic information about yourself (age, gender, location) then a little about what you’re looking for. There’s also a section where you can free write, which eliminates the factual aspect of surveys and quizzes. Unlike other sites, Matchmaker doesn’t create connections based on personality or your interaction (liking other profiles). Instead, they use a “scientific matching system” that uses what you’ve written on your profile to find matches based on 50 attributes. Matchmaker has some benefits. It’s easy to set up a profile, and not very expensive to join. However, with only 10 million active users, fewer people use the site compared to its competitors. Some people have also wondered how many of those users are truly active. People report being set up with matches who have a deleted profile, or getting “messages” when they have a free membership, but when they sign up for the paid membership the messages and reply, no one responds. Some people found people on the site who were just looking for money as well. However, every dating site runs the risk of a few bad apples. It’s important to use your best judgment and make sure you never send personal information (or money) to anyone you meet online. Probably the biggest problem with the site is their lack of customer service. Avalanche, LLC owns Matchmaker, and they aren’t accredited by the BBB and have an F rating, which gives you some hint of the kind of service you can expect from the company in general. 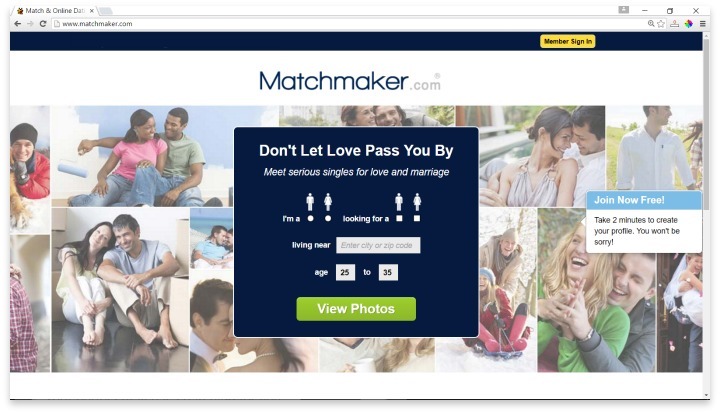 Matchmaker.com caters to helping singles over the age of 35 find lasting love. If customer support is important to you, Matchmaker definitely isn’t a good option. That being said, it seems like dating on Matchmaker itself is a mixed bag. It’s not that great, but it isn’t that bad either. As far as dating sites go, Matchmaker seems about average. If you want a more reliable service then it might be worth it to spend a few extra dollars and go elsewhere. Have you had an experience with this company? Please share your Matchmaker.com reviews below.